The Fujifilm GFX 50R, a 51.4-megapixel rangefinder-style medium format mirrorless camera, will be available from late November with a local RRP of $7099. Fujifilm also announced the ‘GFX 100Megapixels Concept’, hyping up a not-too-distant GFX 102-megapixel medium format camera. The GFX 50R shares many similarities with the GFX 50S, so it’s worthwhile to firstly explore the differences. The 50S features Bluetooth connectivity, weighs less by 145 grams (775 grams), has a different body build, and is cheaper. The new GFX system features a 43.8 x 32.9mm G Format CMOS image sensor, X-Processor Pro image processing engine, 3.2-inch LCD touchscreen, and dual card slots – same as the 50S. The camera has a .77×3.69 million-dot (Sony manufactured) OLED electronic viewfinder. What Fujifilm means by ‘rangefinder-style’ is based on the retro body shape – the viewfinder has been positioned to the left. Fujifilm’s retro Film Simulation modes cover Velvia, Provia and Acros. The camera is weather-sealed in 64 places, and can operate in temperatures as low as -10 degrees. It has a Focus Lever for quick focal point adjustments, and eliminated selector buttons to provider more ergonomic holding area. The top has two aluminum dials which controls shutter speed and exposure compensations. Interestingly, Fujifilm is marketing the GFX medium format systems as ‘super full-frame’. 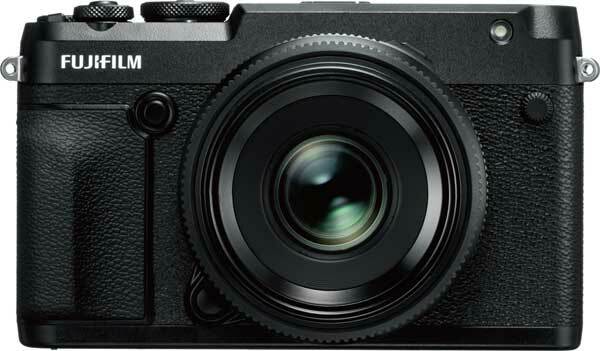 It’s likely aiming to cash in on the current razzmatazz for mirrorless full-frame cameras. And possibly convert a few Millennial influencer-types, who aren’t aware of medium format capabilities. Read the US press release for more info. 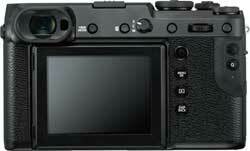 Fujifilm claims the new camera has the world’s highest megapixel count for a mirrorless camera. The sensor is 1.7 times the size of a 35mm image sensor (43.8mm x 32.9mm). The sensor uses a G Format image sensor, which is the first medium format camera to incorporate phase detection pixels throughout the entire sensor, allowing for precise autofocus across the frame. It also has a high-speed X-Processor 4 engine. The camera can shoot 4K video at 30fps – apparently another world first for medium format. Lastly, despite the larger sensor, the magnesium alloy body is roughly the same size and weight of a DSLR. This entry was posted in Deck left, PHOTOKINA 2018 by Keith Shipton. Bookmark the permalink.